Along with resolutions to lose weight, quit smoking, and spend more time with the family, many people can add "I will not illegally download stuff from the internet,” to their New Year’s Resolution list for 2013. The oft-delayed Copyright Alerts System, or “Six Strikes” anti-piracy scheme, is slated to be implemented sometime in early 2013. 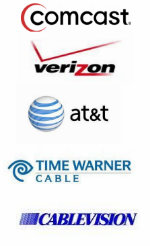 The six-strikes-and-you’re-out plan employs an alert system through which subscribers of five major Internet Service Providers (ISPs) in the United States will be warned that they are breaking the law. That includes illegal peer-to-peer file-sharing of movies, music and other entertainment content. As a first strike, alleged infringers will be notified that they’ve been tracked on copyright-infringing sites. If the behavior continues, the customer will be required to acknowledge that they received the notices. After several warnings, ISPs may then take progressively harsher steps to punish the suspected pirates such as temporarily throttling their speeds, blocking access to frequently visited websites or redirection to a landing page until the subscriber contacts the ISP. The ISPs actually stop short of the “you’re out” part, so supposedly a subscriber will not have their service terminated.